Balmain (French: [balmɛ̃]) is a French luxury fashion house that was founded by Pierre Balmain in 1945. It currently operates 16 monobrand stores, including locations in New York, Los Angeles, Las Vegas, Miami, and in Milan's Via Montenapoleone. In 2016 Mayhoola Investments acquired Balmain for a figure reported as close to €500 million ($548 million). Balmain was 70 percent controlled by heirs of Alain Hivelin. Balmain does not regularly release financial information, but Les Echos estimated its revenue in 2015 at €120 million (about $136 million), growing from an estimated €30 million (about $34 million) in 2012. Balmain expected to reach a revenue of €150 million in 2017, 90% of which is generated by the wholesale channel, and is also putting more effort into direct retail. Balmain was born in 1914 in France. His father owned a drapery business and his mother and sister owned a fashion boutique where he often worked after his father's death in 1921. He attended the École des Beaux-Arts in 1933-1934 with intent to study architecture but instead ended up spending the majority of his time designing dresses. After working for atelier Robert Piquet as a freelance artist and spending time with Edward Molyneux, he left school to work for Molyneux. In the late 1930s, he served in the French air force and the army pioneer corps. After peace was declared, he worked at Lucien Lelong and opened his own fashion house under his name at 44, rue François 1er in Paris. He released his first collection in October 1945 and his first fragrance, Jolie Madame in 1949. 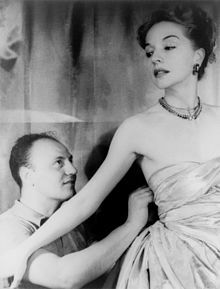 In the period following World War II, Pierre Balmain was "a king of French fashion" and outfitted stars including Ava Gardner and Brigitte Bardot, the Nicaraguan first lady Hope Portocarrero, and Queen Sirikit of Thailand. After Balmain's death in 1982, the house was led by Erik Mortensen, described by Vogue as "Pierre Balmain's right hand". Mortensen had joined the house to work as Balmain's assistant in 1951. After succeeding Balmain, Mortensen worked to maintain the brand aesthetic in the ever-living world of couture while still maintaining the progressive spirit of creativity in the fashion industry. He won two Golden Thimble awards, one for his Autumn/Winter collection of 83/84 and one for the Autumn/Winter collection of 87/88. He left the house in 1990. After his departure, designer Hervé Pierre took over until 1992 working as director of ready-to-wear and haute couture. Possibly the most influential designer to take over at Balmain was Oscar de la Renta, who led the house between 1993 and 2002. Already a fashion veteran before joining Balmain, De la Renta brought a famous face to the brand Balmain. He lived in New York City most of his life, although he was born in the Dominican Republic and became a naturalized United States citizen in 1971. He fit into the Balmain design aesthetic, with an eye for detail and classic silhouettes. He, like Balmain, preferred modest and simple design rather than extremely ornamental and flashy styles. Couture had been suffering at the time since it was an extremely impractical business, so Oscar joined the brand in order to challenge himself and to help it through the beginning of the decline of couture. After Oscar de la Renta's departure Christophe Decarnin joined the house in 2005. Contrary to all the designers before him, Decarnin insisted on bringing the brand into the 21st century. He favored insanely expensive prices and flashy pieces that sharply contrasted with the label's reputation for its classic and luxurious designs. He was considered a "star designer", and the brand became more about his star status than about its clothes. In April 2011 Balmain announced that Decarnin was to be replaced by Olivier Rousteing. Rousteing had joined the company in 2009, after attending a prestigious French fashion school and working under Roberto Cavalli. While he liked Decarnin's aesthetic, he wanted to orient the label towards the finer aspects of French couture. At the time of his appointment, Rousteing was a relatively unknown designer, and has brought a much-needed fresh take on the brand's aesthetic that remains to this day. He was credited with adding an Asian influence to the clothing, as Asia comprises a huge part of the brand's buyers. In 2013, Balmain introduced their Care and Styling for Hair Couture. In November 2015, Balmain released their collaboration with the international Swedish retail store H&M. In April 2016, Balmain opened its New York flagship store in Soho. On June 22, 2016, Balmain announced that their new owner will be Mayhoola Investments. In 2017, Balmain’s creative director Olivier Rousteing debuts Balmain’s first accessory line. On September 1, 2017, Balmain introduced their lipstick collection which was collaborated with L’Oreal. On December 4 2018, Olivier Rousteing introduces Balmain’s new logo. As of 2012, 50% of the company's total income is from license royalties. Licensing, development and production deal for 12 years starting from January 2012. $4.2 million in 2016 sales declined 21 percent at average exchange declining 5.8 percent the previous year. Olivier terminated this contract in March, 2017 due to declining sales. Production was turned over to Inter Parfums America temporarily, until Balmain can work out a deal with a new distributor for its 12 fragrances. From 1947 to 1976 Balmain's directrice (director) was Ginette Spanier. ^ Muret, FashionNetwork.com, Dominique. "Balmain to leverage Olivier Rousteing's pull in ambitious expansion drive". FashionNetwork.com. Retrieved 2018-01-26. ^ "Inside Balmain's Digital Revolution". ^ "Valentino's Parent Company Confirms Purchase of Balmain". Fashionista. Retrieved 2018-01-26. ^ Emirates, Mall of the. "Shopping's never been better, Mall of the Emirates". ^ English, Vogue. "Balmain". Vogue English. Retrieved 2017-09-30. ^ a b c Yaeger, Lynn. "Balmain Nouveau." Vogue (October 2007), p254-56. ^ Duffy, Martha. "Mais Oui, Oscar!" Time 141, no. 6 (February 8, 1993): 68. ^ "Star Designer Leaves Balmain Fashion House". The New York Times. 7 April 2011. ^ Horyn, Cathy. "Balmain Taps an Inside Man". ^ Voight, Rebecca. "Olivier Rousteing Named New Designer at Balmain". ^ "Balmain Hair | About Us". store.balmainhair.com. Retrieved 2018-12-05. ^ "The Business Logic Behind Balmain x H&M". The Business of Fashion. 2015-10-19. Retrieved 2018-12-05. ^ "Balmain's New York Flagship Is Finally Open For Business". Observer. 2016-04-05. Retrieved 2016-04-27. ^ Friedman, Vanessa (2016-06-22). "Can a New Owner Take 'Balmainia' to the Next Level?". The New York Times. ISSN 0362-4331. Retrieved 2018-12-05. ^ "Balmain Debuts An Accessories Line". Fashionisers. 2017-01-16. Retrieved 2018-12-05. ^ "The L'Oreal Paris x Balmain Lipstick Has Finally Arrived | V Magazine". vmagazine.com. Retrieved 2018-12-05. ^ "Balmain unveils its new Instagram-friendly logo". Harper's BAZAAR. 2018-12-04. Retrieved 2018-12-05. ^ Wynne, Alex (2017-03-14). "Balmain Terminates Inter Parfums SA Fragrance License". WWD. Retrieved 2018-01-26. ^ Rubinstein, William D.; Jolles, Michael; Rubinstein, Hilary L. (2011-03-15). The Palgrave Dictionary of Anglo-Jewish History. Palgrave Macmillan. p. 942. ISBN 9781403939104. Retrieved 28 July 2014.